The FA has suspended the Tottenham manager for two matches due to the incident at Burnley last month. Mauricio Pochettino confronts Mike Dean. 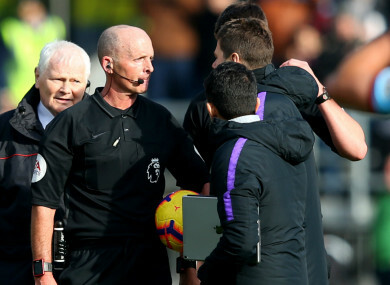 MAURICIO POCHETTINO HAS been handed a two-match touchline ban by the Football Association following his angry exchange with referee Mike Dean after Tottenham’s loss at Burnley last month. The Spurs manager approached the official at the end of his side’s 2-1 Premier League defeat at Turf Moor and continued his tirade despite being told to walk away. Pochettino had hinted that such a ban was forthcoming when addressing the media following Tottenham’s 1-0 Champions League win at Borussia Dortmund last night, which secured a 4-0 aggregate triumph in their last-16 tie. “I’m not going to talk, do you know why? Because you will see tomorrow [Wednesday] why I am talking, or why I don’t want to talk,” he said. “I’m very disappointed. I don’t think it’s going to change, but I don’t care. We are going to be strong. Email “Pochettino fined and handed touchline ban over row with referee Mike Dean”. Feedback on “Pochettino fined and handed touchline ban over row with referee Mike Dean”.